It's the beginning of the year, and one of my friendly neighborhood prime brokers was kind enough to take me out to lunch so we could catch up. 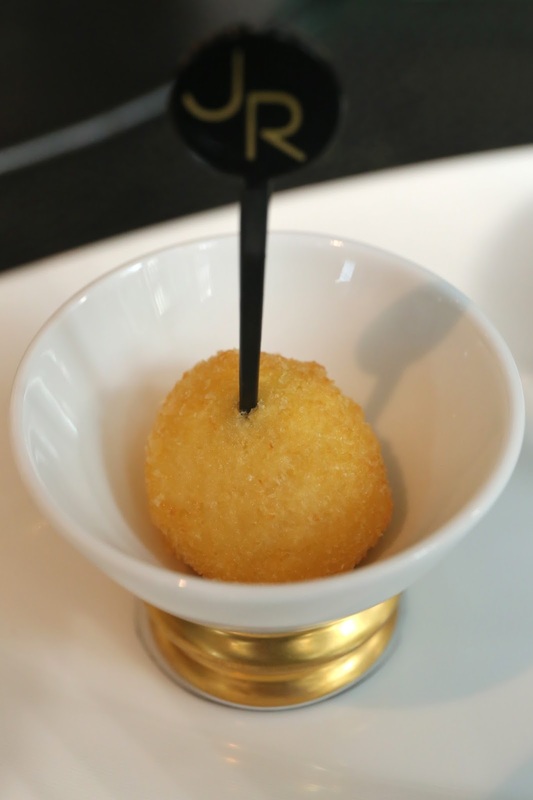 As Amber was unfortunately unavailable, we ended up lunching at L'Atelier de Joël Robuchon. As I haven't been back for a few years, it gave me a good opportunity to look into Chef David Alves' cooking. Foie gras royale with cheese foam - a pretty good way to start, as this warms the stomach and preps it for what's to come. The cup contained brunoise of a crunchy root, which had an interesting fragrance that was somewhat overpowered by the foie and the cheese... although I thought it might have been celeriac. Cromesqui - made with a type of carrot, with a liquid center containing chorizo. Le homard: façon "tsukune" dans un bouillon relevé au gingembre et cèleri - the weather is getting a little chillier, so a bowl of warm soup was just perfect. Clear chicken bouillon was made less ordinary with some kick from ginger and ground pepper (piment d'espelette, perhaps? ), along with the fragrance of celery. Along with small chunks of lobster - homard bleu, no doubt - there were little "meatballs" made from lobster meat, with flying fish roe (とびこ) inside.. Simple and comforting. Le cochon iberique: «la plume» rôti rosé, choux de Bruxelle et racine de cerfeuil au jus - having just had my first taste of iberico pluma two weeks ago, I decided to give this a try. Our waiter suggested medium-rare, and I left it up to the kitchen to decide what's best. What I had in my mouth was very, very delicious. The meat was indeed done rosé, with a smooth and slippery texture in the middle. The exterior was nicely browned and delivered nice and smoky flavors, well-seasoned by black pepper. Loved the Brussels sprouts. A relatively light and satisfying lunch, finished with a shot of espresso accompanied by some caramel sauce. I did have a taste of that caramel sauce on its own, and it was pretty tasty alright... but nowhere as thick and heavenly as the one in Macau. Many thanks to my friendly neighborhood prime broker for the treat. I was disappointed he didn't know what the strawberry variety was.. get a grip you sad case .